"Philip Green, national thief, pay your tax or we won't leave!" 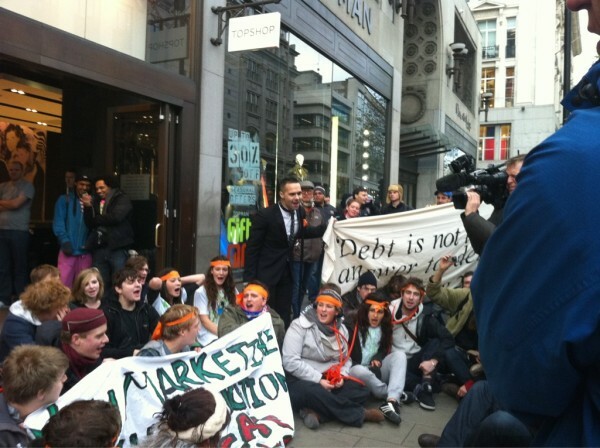 and "Philip Green's taxation could pay for Education" are two of the chants causing Top Shop in Oxford Street to try turning up the music to drown out the protests in Oxford Streets TopShop flagship store. One Top Shop employee begged flashmobbers to trash the store, explaining that even though Top Shop's profits have risen by 19%, employees are to receive a measly £5 bonus." Philip Green argues that he hasn't avoided his tax. In making that argument, he is using the, er, Philip Green defence. The Tax Justice agenda is spreading.